The GATER module simple noise gate for removing unwanted noise in a track. At 0%, the signal is clean. At 100%, the cutoff and release are very snappy and removes all but the loudest sounds. Clipping LED. 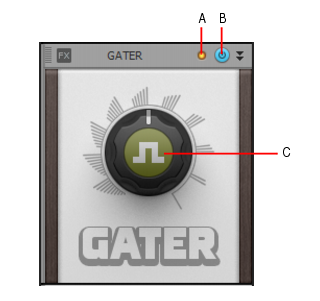 Shows if the input signal to the GATER module is clipping. If there is any distortion in the ProChannel signal chain, the clipping LEDs let you identify where the clipping occurs. GATER enable/disable . Enables/disables the GATER module. GATER. Adjusts the gating intensity. At 0%, the signal is clean. At 100%, the cutoff and release are very snappy and removes all but the loudest sounds.